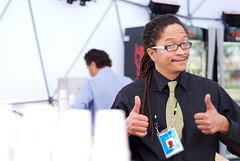 TED2011 marks the debut of Coffee Common, a really cool consortium of coffee roasters — competitors, in one sense, but united by a shared goal: to educate people about great coffee. And it’s not just a taste thing, says Stephen Morrissey, a champion of Coffee Common (and himself the 2008 World Barista Champion). It’s about making a better world — because drinking great coffee reflects an investment in sustainable small farms, most in developing nations. 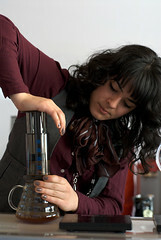 Left: Laila Ghambari of Stumptown using an Aeropress. Photo: Brian W. Jones. 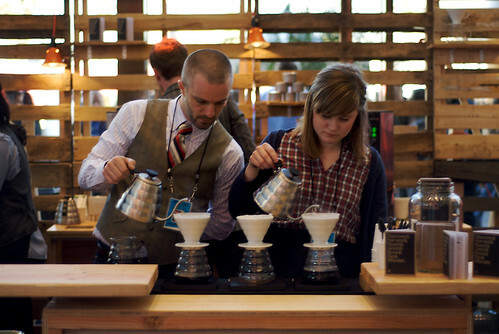 Above Mike Phillips, the reigning World Barista Champion for 2010, and Oda Misje Haug, the two-time champion of Norway. (She’s 20.) Photo: Brian W. Jones. Thank you for the creation of “Coffee Common”. I couldn’t agree more with the global & sustainable aspects for this wonderful beverage. From the small coffee farm in Kenya to the incredibly talented baristas who create liquid perfection. There’s a lot of love and a lot of good that goes into that warm and comforting cup you hold in your hands.